Photo by Nancy Ballesteros. 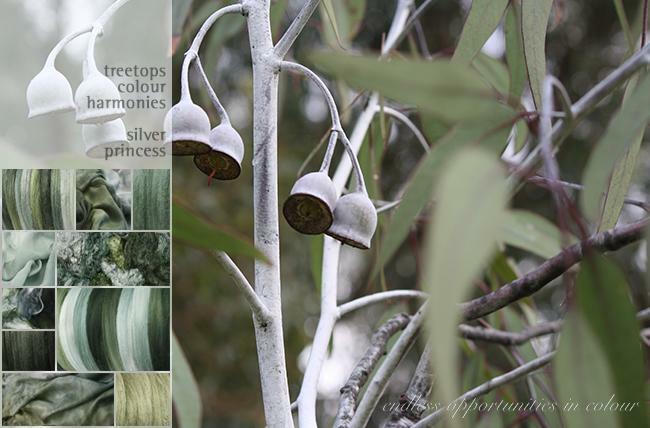 This inspiring ‘Silver Princess’ (Eucalyptus caesia) tree lives in my front garden. I admire its beauty and grace everyday. 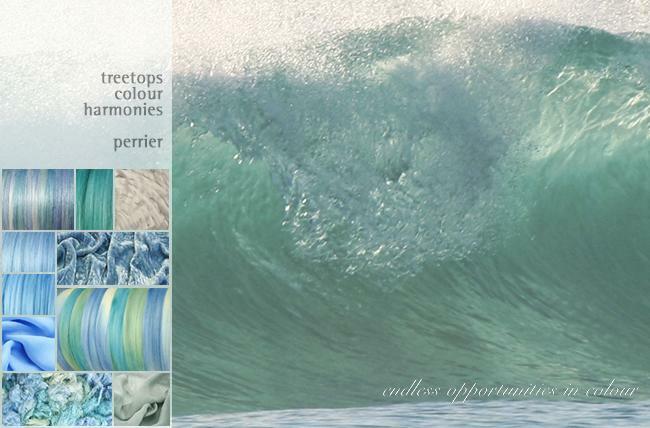 It was pure pleasure designing a Colour Harmony in its honour. Fibres shown above (starting upper left): tussah silk tops colour harmony – silver princess, tissue silk fabric colour harmony – silver princess, merino wool solid – eucalyptus, tissue silk fabric solid – linger, silk throwsters waste – silver princess, silk hankies colour harmony – silver princess, merino wool colour harmony – silver princess, merino wool solid – blue gum, paj silk fabric colour mark – silver princess, tussah silk tops solid – spanish olive. Photo by Nancy Ballesteros. 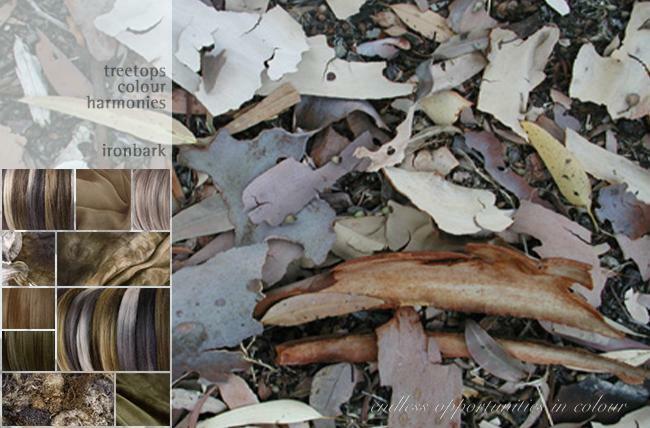 Glorious earthy hues of Eucalyptus bark litters the ground after their growth spurt in winter when the rains comes. Fibres shown above (starting upper left): tussah silk tops colour harmony – ironbark, tissue silk fabric solid – mule, merino wool solid – riverstone, silk hankies – ironbark, paj silk fabric colour marks – ironbark, merino wool solid – mule, merino wool colour harmony – ironbark, merino wool solid – marsh, silk throwsters waste – ironbark, paj silk fabric colour tones – sage/marsh. Photo by Selena Ballesteros. Our first holiday off the Southern coast of Western Australia took my breath away, the colour of the ocean was magnificant! 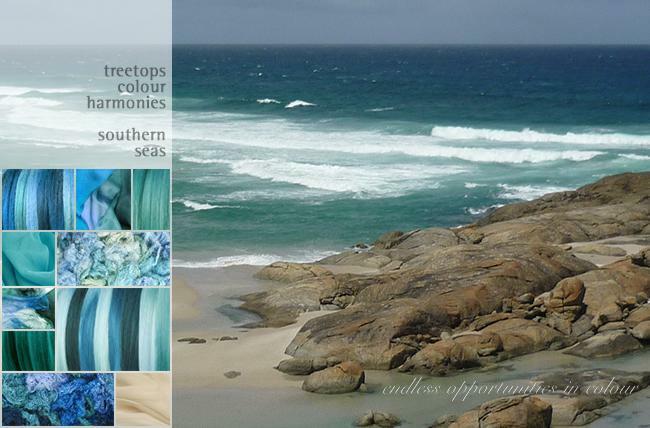 That image stayed with me for years and was finally re-created in a Colour Harmony to be called Southern Seas. Fibres shown above (starting upper left): tussah silk tops colour harmony – southern seas, tissue silk fabric colour harmony – southern seas, merino wool solid – calypso, tissue silk fabric solid – lagoon, silk throwsters waste – perrier, silk hankies colour harmony – southern seas, merino colour harmony – southern seas, merino wool solid – jewel, silk throwsters waste – southern seas, tissue silk fabric solid – stone. Photo by Nancy Ballesteros. 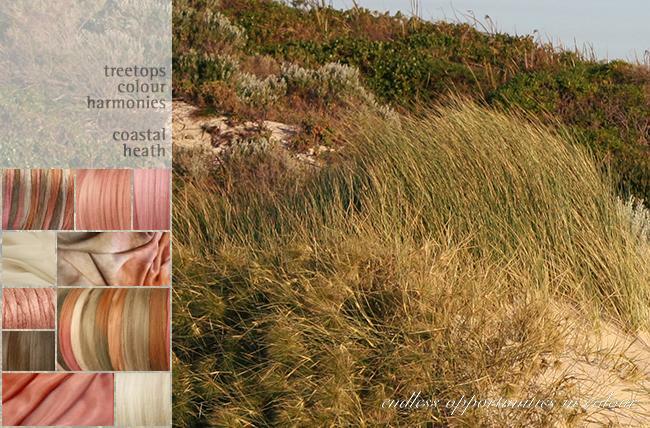 The windswept dunes along the coast of the Indian Ocean harbour an amazing array of coastal heath, grasses and scrubby eucalyptus bush. 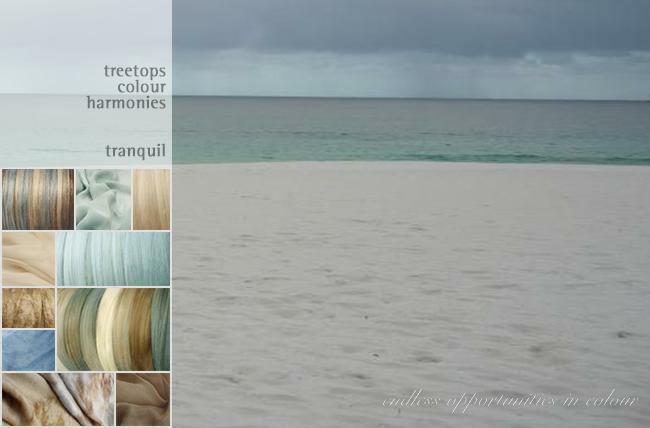 A lovely soft palette of beuatifully muted tones. Fibres shown above (starting upper left): bombyx silk tops – coastal heath, merino wool solids – nudie, merino wool colour nuance – pink hydrangea, tissue silk fabric solid – stone, paj silk fabric colour marks – coastal heath, tussah silk tops solid – nudie, merino wool colour harmonies – coastal heath, merino wool solid – mule,paj silk fabric colour tones, – nudie/sandalwood, merino wool colour nuance – stone. Photo by Selena Ballesteros. Taken while hiking along the Southern coast of Western Australia. Fibres shown above (starting upper left): bombyx silk tops – tranquil, tissue silk fabric solid – linger, merino wool colour nuance – stone, tissue silk fabric solid – stone, merino wool colour nuance – china blue, tussah silk tops solid – toast, merino wool colour harmonies – tranquil, silk hankies solid – china blue, paj silk fabric colour marks – tranquil, tissue silk fabric solid – mule. Photo by Nancy Ballesteros. 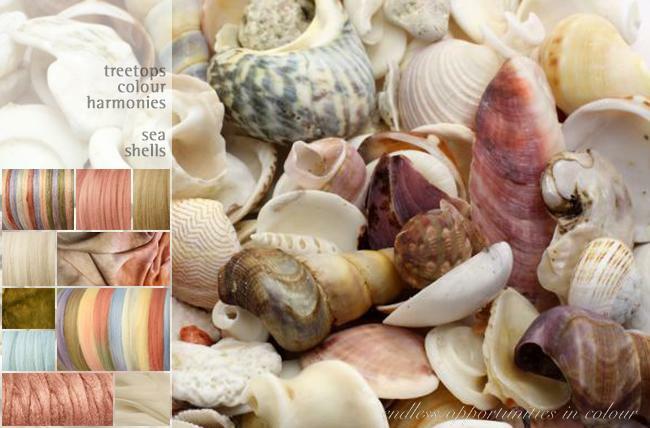 It’s impossible to walk along our gorgeous long white sandy beaches and not fossick for shells and sea glass. A small sample from my coveted collection. Fibres shown above (starting upper left): bombyx silk tops – sea shells, merino wool solids – nudie, merino wool colour nuances – toast, merino wool colour nuances – stone, paj silk fabric colour marks – coastal heath,silk hankies solids – tarnish, merino wool – sea shells, merino wool colour nuances – china blue, tussah silk tops solid – nudie, tissue silk fabric solid – stone (smokey amethyst also looks really nice as well). Photo by Nancy Ballesteros. Just another gorgeous surf break in the Indian Ocean, Western Austalia. Fibres shown above (starting upper left): bombyx silk tops – perrier, merino wool solid – calypso, bombyx silk tops – natural, merino wool colour nuances – china blue, silk velvet – indian turquoise, merino wool solid – heavenly blue, merino wool colour harmonies – perrier, tissue silk fabric solid – heavenly blue, silk throwsters waste – perrier, tissue silk fabric solid – linger. Photo by Heather Davis. A 1,000 kilometres north of Perth, centred in the Hamersley Ranges of the Pilbara region is Karajini Nathional Park, Western Australia. 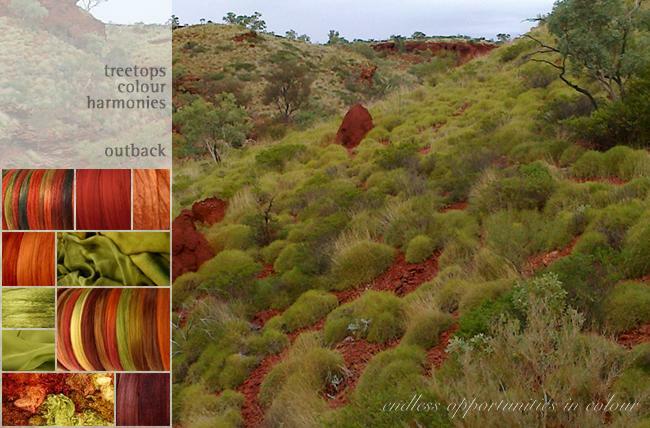 This is ‘red earth’ country filled with spectacular gorges, spinifex grass and rocky outcrops. Fibres shown above (starting upper left): tussah silk tops colour harmony – outback, merino wool colour nuance – peri peri, tussah silk tops solid – terracotta, merino wool solids – henna, paj silk fabric colour marks – machu picchu, tussah silk tops solid – moss, merino wool colour harmony – outback, tissue silk fabric solid – moss, silk throwsters waste – outback, merino wool solid – nomad. Photo by Janaka Dharmasena. We love being inspired by food. 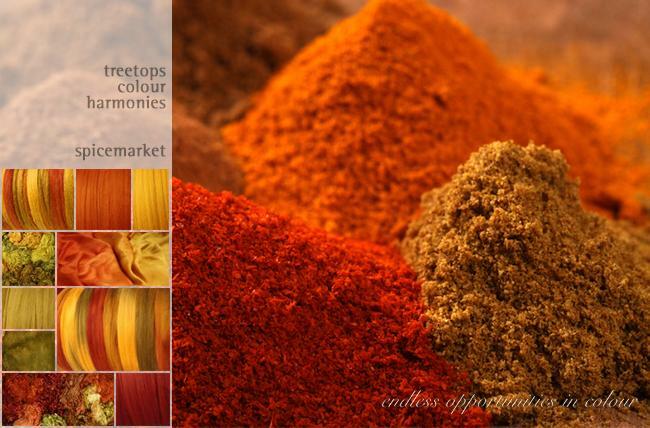 This has been one of our all time favourite Colour Harmony – Spice Market. Fibres shown above (starting upper left): tussah silk tops colour harmony – spice market, merino wool colour nuance – terracotta, merino wool colour nuance – mud honey, silk throwsters waste – citron, paj silk fabric colour marks – spice market, merino wool colour nuance – cumin, merino wool colour harmony – spice market, silk hankies solid – tarnish, silk throwsters waste – outback, merino wool colour nuance – peri peri. Photo by Steve Estvanik. 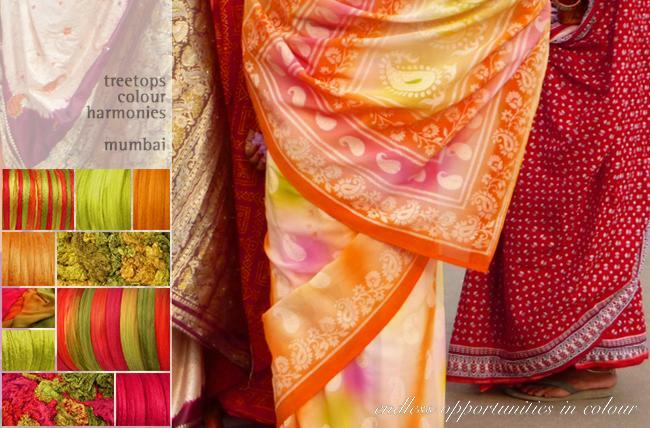 Who can resist the hot colours of India and all those beautiful saris! Fibres shown above (starting upper left): bombyx silk tops – mumbai, merino wool solid – wasabi, merino wool solid – tumeric, tussah silk tops solid – tumeric, silk throwsters waste – citron, silk hankies colour harmony – mumbai, merino wool colour harmony – mumbai, tussah silk tops solid – wasabi, silk throwsters waste – mumbai, merino wool solid – ruby red dress.